Do you do much deadheading? It’s a garden chore I get pretty lazy about. But the other day I just couldn’t ignore my front door planters any longer. The geraniums were looking very neglected and sad, and the blooms were becoming few and thin. An inexperienced gardener might think their plant had completed its natural lifespan and was winding down for the fall, but no! 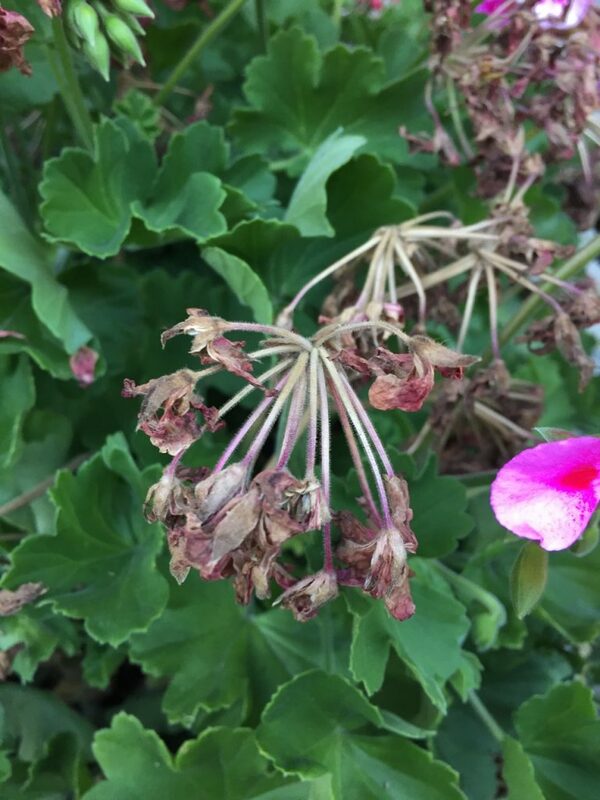 Don’t dismiss your sad geranium as done for the season! Deadhead it! What the heck is deadheading you ask? No, it has nothing to do with ’60s rock n’ roll. It’s a gardening term describing the removal of spent blooms that helps encourage your plants to keep on blooming. Geraniums respond very well to the practice, and a couple days after a good deadheading, mine are already bursting with new buds ready to bloom again. If you think about it, a flower’s purpose is to grow, flower, develop seeds to propagate itself, and then die. So if you prevent it from developing those seeds, you can encourage it to keep putting energy into flowering. Not all annuals or perennials need to be deadheaded, but some common ones will do really well if you keep up with it. Deadheading is also advantageous to controlling plants that aggressively reseed themselves. And deadheading just generally keeps your garden looking tidy. You can deadhead almost anything that flowers, although not all plants need it. Plants that tend to respond with more blooms include petunias, flowering maples, roses, geraniums, marigolds, cosmos, snapdragons, coreopsis, yarrow, heliotrope, tulips, daffodils, sweet peas and zinnias (to name just a few). You don’t need to deadhead plants like impatiens, most flowering vines, grasses, sedums or ground cover plants. Or anything that’s so tiny it would drive you to drink to do it. Unless you get your kicks out of that sort of thing. Frankly, I have other things on my to do list and I’m not that obsessive. Deadheading is easiest to do with a small pair of clippers, although sometimes you can just pinch off the blooms just below the flower head. Geraniums are very easy to deadhead; the spent blooms usually just pull away when they’re dry enough. If they aren’t, just clip them down close to where the leaves start. That’s pretty much all there is to your garden happily blooming all summer long. Previous Post Black currant, how do I love thee?